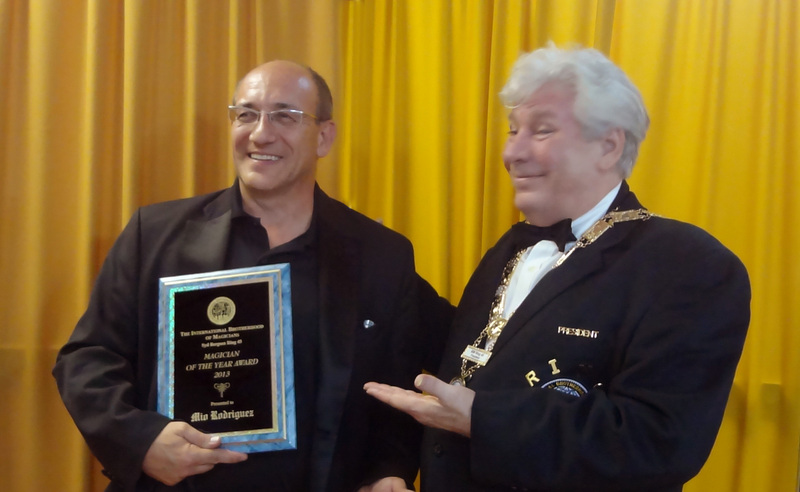 The International Brotherhood of Magicians, Ring 45, has named Miami resident and professional magician, Mio Rodriguez, of Magic By Mio, Inc., as 2013 Magician of the Year! The presentation was made February 6th in South Miami by both 2013 President Rick Del Vecchio and 2014 President Roy Allen Fischer. Mio, born into a theatrical family in New York, is a graduate of Binghamton University and launched his career as professional magician in 1990. He has travelled the world, giving people a sense of wonderment and is at ease entertaining at family celebrations, facilitating corporate team building presentations, as well as filling theatres with his charismatic presentation of magic and mentalism! Celebrities too have raved about his performances, most recently Barbara Streisand, Robert De Niro and LeBron James and Pat Riley of The Heat! If you are interested in hosting a Close Up Magician for your next event, please feel free to contact Magic By Mio anytime.